Nematodes are relatively small invertebrate animals that are especially common in soils and aquatic environments. They range in size from 100 µm to 30 feet in length. The largest nematode parasitizes whales. Most of the nematode species are characterized as "free-living" meaning that they are not dependant on a parasitic life style. Free-living nematodes forage for microorganisms in the soil and water, and some attack other nematodes. Approximately 10% of nematode species are parasites of animals including humans. Birds, fish, mammals, worms, etc. are common hosts of nematodes. About 15% of described nematodes are plant parasites. Most plant pathogenic nematodes are 0.5 to 4 mm in length, and somewhat more slender than a human hair. Probably all plants with root systems are parasitized by plant parasitic nematodes. Generally, significant damage to plants occurs only in agricultural environments and only when nematode populations are relatively high. Plant parasitic nematodes have a protractible hollow or grooved spear (stylet) in their head which they use to puncture plant cells and withdraw the contents. Plant parasitic nematodes can be grouped by their mode of feeding. Those that remain outside of the plant and puncture the root cells with their stylets are called ectoparasites. 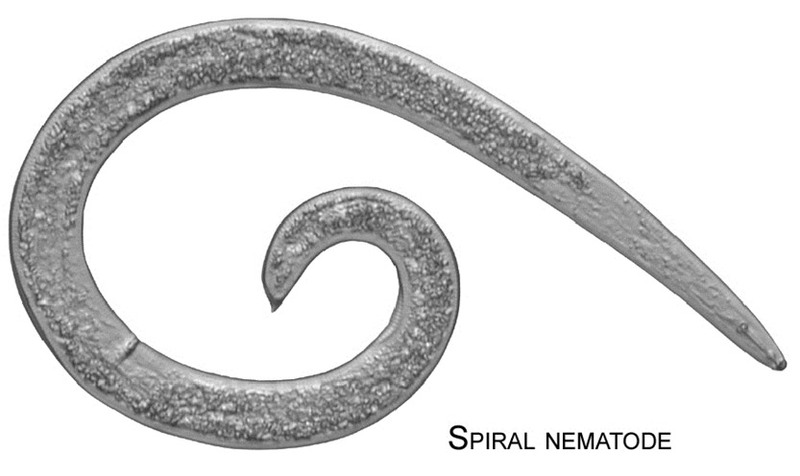 Some ectoparasites have short stylets and only puncture the epidermal (surface) cells; those with long stylets penetrate more deeply into the root. Endoparasites enter into the plant tissue. Some endoparasites remain in one place and feed and others migrate through the tissues. Endoparasites do much more damage to plant tissues than ectoparasites. Some nematodes have a combination of ectoparasitic and endoparasitic feeding habits. In the Northeastern United States, the most common plant parasitic nematodes in turfgrasses are listed in the table above. The nematodes are more or less ranked by approximately how frequently they are encountered in turfgrasses. Ring, stunt, spiral and lance are the most common. Golf greens provide an ideal environment for nematodes. Greens provide the nematodes with a uniform host with a long growing season. The soil is 75 to 95% sand which provides ideal pore spaces for oxygen, water and nematode mobility, and the greens are watered frequently. Nematodes are aquatic animals and need moisture for mobility. Golf greens can have some of the highest populations of nematodes found in agricultural soils. Measurements of nematodes are more conveniently expressed in millimeters rather than inches. There are 254 millimeters (mm) in one inch. Ring nematodes are very common, relatively small (0.5 to 1 mm), stout ectoparasitic nematodes that are named for the distinct ring-like ornamentation of their cuticle. Ring nematodes are common in turfgrasses but are not very pathogenic. Populations of a thousand per 100 cc of soil can be found in relatively healthy turf. In New England, the threshold level is 1500/100 cc of soil. This figure may underestimate their pathogenicity to turf. Ring nematodes are not very mobile and they tend to have a very clumped distribution in soils. A composite soil sample that results in an average of 1500/100 cc means that there are hot spots of much higher populations. Stunt nematodes are common, small (1 mm long) slender ectoparasites of grasses and other plants. They feed primarily on epidermal cells and root hairs. High populations of stunt and lance nematodes are commonly associated with decline of turfgrass in putting greens. New England threshold levels are 800/100 cc of soil but visible damage would not be expected at this level unless several other stresses are present. Lance nematodes are common, robust, moderately large nematodes (1-2 mm) that feed ectoparasitically and endoparasitically on turfgrass roots. High populations of lance and stunt are commonly associated with decline of turf in putting greens. Because lance nematodes can move into the roots and cause considerable damage, threshold levels are lower than for stunt nematodes; 400/100 cc. Root-knot nematodes are endoparasitic and are probably the most important nematode world-wide with respect to crop losses in agriculture. They are named after the galls they produce when they infect roots. Root-knot nematodes that infect turfgrasses don't infect other hosts. Rather than distinctive galls that other root-knot nematode produces, the grass root-knot nematode produces swollen roots. It is difficult to determine the potential disease pressure from soil assays. When the juvenile root–knot hatches from the egg, it enters into a root where it remains for its entire life. In New England, the best time to assess the infection potential of root-knot nematodes is in the spring, as soon as the ground thaws, or perhaps mid-April. Once they move into the root, they are safe from toxicants applied to the soil. A soil sample taken in July can show a very low population of juveniles in the soil and yet the grass may have a very significant problem with root-knot. For this reason, any indication of the presence of root-knot nematodes during the summer should be reevaluated the following spring. Spiral nematodes are named for their propensity to coil into a spiral shape. They are a little more robust than stunt nematodes and up to 1.2 mm in length. Spiral nematodes feed on a wide range of hosts besides grasses but do not appear to be overly damaging to turf. Threshold levels for New England are 1,500/100 cc. Needle nematodes are very long nematodes, up to 5 mm in length. This ectoparasite has a very long stylet and tends to feed on root meristems resulting in swelling of the root tip. Occasionally they are found above the threshold of 100/100 cc of soil. This threshold may underestimate their pathogenicity to turf; in corn seedlings, 10/100 cc of soil are considered damaging. As few as 30 needle nematodes/100 cc of soil can prevent turfgrass seedling establishment. Nematode populations should be evaluated in context with past and prevailing circumstances such as: species and numbers of nematodes present, the depth of soil the sample was taken, species composition of grasses, depth of root system, soil texture, symptoms, extent of damage, and presence of other stresses to the turf. Threshold levels (the nematode population levels which justify the implementation of control measures), are dependent on these variables. At this time there is very little experimental data to establish threshold levels for golf greens in the northeast. The numbers listed below are based on information gleaned from experience as well as from case-history information and survey results compiled in the northeast. They are to serve as a guide only. * Developed by Robert Wick, PhD, University of Massachusetts. These threshold levels are based on field observations and laboratory assays from the New England region. Extenuating circumstance such as geographic location, method of sample collection, assay methods, host, and prevailing environmental conditions, can affect the interpretation of threshold levels. ** From: Turfgrass Trends, Oct 1995. Eric Nelson, PhD, Cornell University. Nematodes injure turfgrass roots by either feeding on, or by burrowing through tissues. Depending on the host and the nematode involved, symptoms on roots include: inhibition of root elongation, swollen tips, galls, lesions, and shortened stubby roots. In most cases root symptoms are not obvious. Symptoms occurring above-ground result from root dysfunction and are not unique to nematodes. Patchy areas of wilting, thinning and decline occur where nematode populations are excessively high. Above-ground symptoms are of little value in diagnosing nematode problems in turf. An accurate assessment of the pathogenic potential of nematodes can only be determined by a nematode assay. Nematode populations are unequally distributed in soil so they are most accurately estimated with a composite sample. Use a ¾ to 1 inch diameter soil probe, or something similar, and sample to a depth of four inches throughout the site. This depth is a compromise but represents the population distribution of different species fairly well. After removing the soil core, tear the top ½ inch of turf and thatch off of the core. Fill the hole with dry top dressing leaving a ½ space and replace the turf plug. If a portion of the turf appears unhealthy, collect 15 to 25 subsamples from throughout the affected area and bulk them as one sample. For comparison, a composite sample should also be taken from an adjacent, healthy appearing area. A cup-cutter sample taken within the declining turf is acceptable but a composite sample is preferred. There is a $75 fee per sample.